With the draw, Ghana survive to fight another day. Klose, who came on as an sub, scored the equaliser for the Germans and equalled Ronaldo’s 15 goals record. He also became the oldest scorer in the World Cup, at 36. What a day of football! 90+3′ – Muntari booked for the second time in the tournament and will miss Ghana’s Portugal clash. For today, it also meant a minuted defending to do as Germans are awarded a free-kick from the challenge. 90+1′ – Wakaso Mubarak ruled off-side after a thrilling run from Ghana on counter. 90′ – German, on the other side, won a corner for themselves thanks to a reckless clearance from a Ghana defender. Three minutes ADDED. 89′ – With only a minute left to the regulation time, Neuer came out a dangerous clearance. Had he missed the ball or mistimed??? 88′ – Jordan, after a fine run-down the right flank, set-up Gyan to release a cross inside the German box. Instead, Gyan took the shot, which went off the radar. 87′ – The Ayew brothers are creating chances for the Ghana team. Jordan had tested Neuer couple of times in the last five minutes. 85′ – Another Jonathan Mensah defending, this time, Ozil’s cross inside the box was heading for Klose. But the centre-back was brilliant. 83′ – A couple quick exchanges from either end was followed by a German corner. Moments earlier, Ghana got a clear chance, which was saved by Neuer. On return, they found themselves scrambling in defence. 82′ – From the goal-kick, a well directed ball got hold of Jordan Ayew inside the German half. 80′ – Muntari penalised for a tackle on Schweinsteiger. From the free-kick, Ozil got a free-run inside the Ghana box, then he back-heeled the ball for Lahm. But to no avail. 79′ – Two new men, Jordan and Schweinsteiger engaged in a duel in the far corner in the German half, with the the Bayern Munich player winning. 78′ – From the resulting play, after the corner, new man Emmanuel Agyemang Badu tried to drill trhough the German defence with a right footed shot. His shot, however, failed to find the target. 77′ – Ghana won a corner kick from their goal-kick. 76′ – From some 30 metres, Bastian Schweinsteiger took the kick after three dummies. But his attempt was off the radar. 75′ – After few anxious moments, Ghana conceded a free-kick in a dangerous area after Jordan Ayew tripped Lahm. 72′ – Germany got another corner. Before the play resumed after that Klose goal from the previous corner, Ghana made a SUB, bringing Wakaso Mubarak for struggling Christian Atsu. 70′ – And within seconds, Klose plodded home a the equaliser. The German legend has scored 15 times in the World Cup. What a moment. 69′ – Double SUB for Germany: Mario Gotze made way for the veteran Miroslav Klose, while Sami Khedira is replaced by Bastian Schweinsteiger. 68′ – Ghana failed to capitalize from the Christian Atsu delivery. 67′ – It’s all Ghana now. Have won a corner kick after. Moments ago, they have got a good chance to increase the lead. 64′ – Asamoah Gyan made it two for Ghana after sending the ball pass an onrushing Neuer. It was a great interception from Muntari from the German play, before releasing the ball. 61′ – Goal-kick for Ghana as a long ball from Germany crossed the goal-line. From the play, Asamoah Gyan got a free run until Hummels’ climbing header cut short the run. 60′ – At the hour mark, Germans asked for hand-ball by a Ghana defender, but the referee allowed the play to continue. 59′ – Germans probed the Ghana back-line with two incisive runs. 58′ – Following two goals in quick succession, Sulley Muntari got another chance as he got a clear shot on the goal. 55′ – Ghana responded with a brilliant header by Andre Ayew, from a Harrison Afful delivery from set-piece. New man Shkodran Mustafi could have done better marking Ayew. 52′ – Ghana SUB: Kevin-Prince Boateng replaced by Jordan Ayew. 51′ – Germany lead after Mario Goetze headed down a delivery from Thomas Muller from the right. His 10th for Germany. 49′ – Sulley Muntari is everywhere. This time clearing a dangerous looking ball with cycle-kick. 48′ – Germans, defending a high-line, are handling the Ghana attack pretty well. 47′ – During the break, Germany made their first substitution. Jerome Boateng out, Shkodran Mustafi in. 46′ – Spirited start from Ghana. Won a throw-in in the German half. Players are ready for the second-half. Despite failing to score in the first-half, Germans fans will be happy, at least. Because, they have not lost any of the previous 13 games after playing out a goalless first-half. Seven wins and six six draws!! In the first-half, Germany had greater possession but Ghana created more chances. The Africans had eight attempts, with three hitting the target. For the Europeans, three found the target from five tries. Equal numbers of saves, three each, by the goal-keepers helped the score-board remain blank. 45+1′ – After one minute of ADDED time, the referee called for the break. 45′ – Sulley Muntari got an attempt from a tight angle. He did curled the ball, but failed to hit the target. 44′ – Brilliant run from Christian Atsu. He created an opening for Andre Ayew, a header. From the attempt, Jerome Boateng got the final touch to give Ghana a corner. 43′ – With a couple minutes into the break, Hummels released a long ball. But Ghana got the possession back, then a throw-in in the German half. 42′ – Unlike the previous games, both the sides are attacking so fast. In the last sixty seconds, both the sides have got at least one chance each besides a free-kick. 41′- German got another chance from the restart following a Ghana off-side run. 40′ – Andre Ayew and Sulley Muntari combined beautifully to win back the ball. 39′ – Ghana are defending deep, as at least seven Germans are pressing for that vital opening goal. 38′ – Harrison Afful did brilliantly to reach to the ball in the German half, but his bid to control the ball left him rueing. Throw in for Germany from the left. 37′ – Gotze, looking for his tenth German goal, tested Fatawu Dauda. 36′ – Lahm delivered a long, high ball for his striker, but the ball was headed away to the safety by a Ghana defender. 35′ – John Boye is having a great game. Once again got himself on the line of fire. His intervention left Ozil stranded. 34′ – Little man Asamoah Gyan beat Per Mertesacker on the run, on the left flank, then cut inside the German box. But from their, he got the ball out of the play. 33′ – From another quick start from Ghana, Neuer was called into action. Sulley Muntari’s left footed drive was travelling, and also hit the target. 31′ – Asamoah Gyan got the better of Hummels, then Ghana had a chance from outside the box. But Neuer was on his mark, released from the collection and on the other side, there was a chance for the Germans. 30′ – At the half-hour mark, Boaten brothers engaged in a physical duel in the German half, in a bid to control a high ball. 29′ – Almost an own goal for Ghana as Mario Goetze’s minus was deflected off a defender. Corner, first of the match. 27′ – After those initial chances, the play is now concentrated in the centre, with both sides settling in. 25′ – Ghana witched flanks comfortably. After a couple of minutes in creating an attack, Sulley Muntari was caught off-side. 24′ – Following the set-piece play, Germany created a couple of chances. But all in vain. 21′ – Great defending from by Andre Ayew, falling back to support the Ghana defenders. But soon after, Germans won the ball back and Ozil was once again delivering a good release for Muller. 20′ – Both Ozil and Muller caught off-side, from the counter. 19′ – Harrison Afful started a good run from the left. After few exchanges inside the German half, they lost the possession. 18′ – Sami Khedira got an attempt saved by Fatawu Dauda. He was beautifully set-up by Ozil from the right. 17′ – Mats Hummels involved in couple of attempts to dissect the Ghana defence. But failed to find any of his team-mates. 15′ – But from the resulting play, Ghana once again won a throw-in in their own half, on the left. 14′ – A little period of rebuilding, or introspection for the three-time champions as their midfielders rolled the ball around the park. 13′ – What a back-heel pass from Asamoah Gyan. But after the delivery, he was late to received the ball back from Andre Ayew, probably over-crowded by the German defenders. 12′ – Christian Atsu got an excellent shot, but Neuer was equal to the task. Saved diving to his left. 11′ – Mohamed Rabiu caught late on Mesut Ozil, Free-kick to the Germans. 10′ – Ghana lost possession in their own half again. And three Germans targeted the goal. But the Box was too crowded. 9′ – Ozil was there. But Philip Lahm’s release was little too early for the Arsenal player to make the final contact. 8′ – Manuel Neuer got the first touch as he found the ball rolling back to him after a German defensive play. From his play, German tried to launch a renewed attack, but Ghana defenders are alert. 6′ – Asamoah Gyan, playing in his ninth World Cup match, almost provided Ghana the lead. He was unmarked inside the German box, but his attempt sailed over the bar. 5′ – In these initial minutes, Ghana are matching the German might. 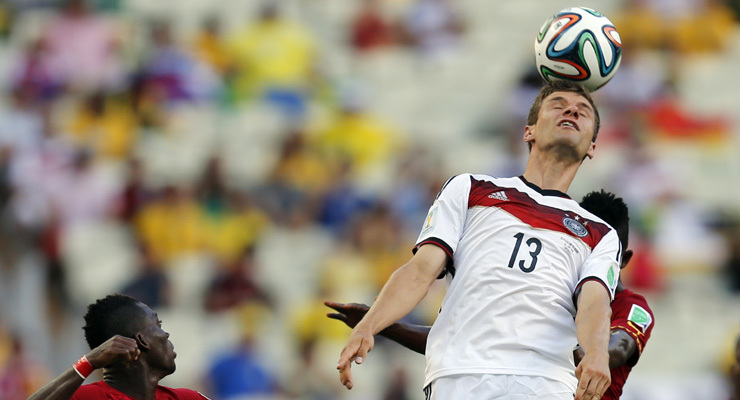 4′ – Having conceded the free-kick, the Germans won the ball back and launched a swift counter attack. But Jonathan Mensah was there for the Africans. he blocked the run. 3′ – Sami Khedira conceded a free-kick as he planted his left foot to an onrushing Sulley Muntari. From the set-play, Muntari got the ball delivered. 2′ – From the Ghana goal-kick, Germans won the first throw-in of the match. 1′ – It’s quite start from the Germans. From the centre, they got the ball in their own half. Then, suddenly a burst on the left flank, almost created the first chance of the match. Germans, in all whites, will kick start the match from the centre, from left to right. Ghana are in all reds. For the African side, four changes have been made after losing their opener to the United States, including the goalie. But unluckily for Bastian Schweinsteiger, he is again on the bench. Per Mertesacker, who got a starting place, is making 100th appearance for Germany. Sandro Ricci, the 39-year-old Brazilian referee, will conduct the match. He is the first official to award a World Cup goal with the aid of goal-line technology, during the France-Honduras match. One interesting fact emerging from the team-sheets is that of two Boateng brothers playing against each other with Jerome in Germany’s defence while Kevin-Prince leading Ghana’s attack. Welcome to our coverage of this Group G encounter between Germany and Ghana at the Estadio Castelao in Fortaleza . Germany steam-rolled Portugal in their first match with a 4-0 win. Ghana were stunned by USA who scored late on to register a memorable 2-1 win. Germany will book their place in the Round of 16 if they beat Ghana today. The good news for the German`s is the return of Bastian Schweinsteiger who missed the match against Portugal with an injury. Mats Hummels is may not start against Ghana today and his place will be taken by Shkodran Mustafi. Ghana`s experienced midfield general, Michael Essien is expected to take his place in the center of the midfield after he recovered from a toe injury. Asamoah Gyan will be leading the line for the Africans and is also their biggest hope of scoring against the mighty Germans. The two teams met in the third group game four years back in South Africa, where the Germans emerged on top and will again today start as the favourites. Ghana will look to absorb the German pressure and will try and hit them on the break.